Have you ever cheated at school ? 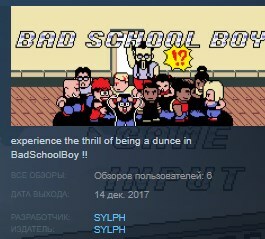 Well if you haven't, don't miss your chance, as you can now experience the thrill of being a dunce in BadSchoolBoy !! In this puzzle/shooting game, toss paper balls at your classmates to get test answers and not fail your exams... Or else be ready to get kicked out of school. Wreak havoc in class to earn new special attacks and be better during exams, but make sure the teacher doesn't catch you red handed ! The final version of the game will span over 4/5 years, each including 12 lessons and 12 tests. Fun, addictive and featuring hand-made pixel art graphics, I hope you enjoy BadSchoolBoy and will be welcoming your feedbacks.